Managing director at Core Post Matt Brown reveals how he used DaVinci Resolve's 3D tracker, key lighting, and color tools to complete the final grade for new Sky 1 football comedy drama series, "Rovers." 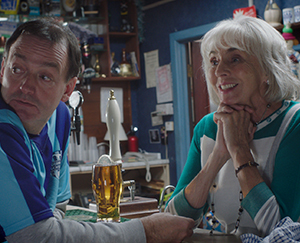 Set in the run down clubhouse of fictional non league team Redbridge Rovers FC, brand new Sky 1 football comedy "Rovers" reunites "The Royle Family" stars Craig Cash and Sue Johnston in a hilarious depiction of what life is like for the steadfast supporters of a small football club in England. With average attendances of just 27, it's a far cry from the glitz and glamour of the Premier League. Delivering full post production for the comedy series, including completion of the final grade using DaVinci Resolve Studio, was Salford based post house, Core Post. "Our team have historical working connections with both director Craig Cash's Jellylegs Productions and producer Gill Isles, so we were very excited about the idea of working on a brand new comedy together," begins managing director and colorist at Core Post, Matt Brown. He explains that he maintained a very close working relationship with both Cash and director of photography Daf Hobson from the very start, exploring the various looks that could be used to grade each episode. "The overall idea was to create a naturalistic, daylight feel within the studio set, whilst maintaining and enhancing the key lit look that beautifully framed the characters," Brown reveals. "However, despite this prominent style of key lighting, adding some beautiful shape and style to the characters' look, it also lead to some darker areas in the frame, especially on the actors' faces where it would occasionally leave the fill side of the face looking a little dark." "The key challenge we faced, as with all comedy drama, was to retain the detail in the actors' faces, while still achieving the desired look," he continues. "DaVinci Resolve was perfect for handling this. It's 3D tracker is outstanding, and when combined with DaVinci's subtlety at handling luminance lifts and graduation, it was more than capable of enhancing the fill areas whenever required. This allowed me to quickly and easily give the overall look a lift in the shadows to counteract the darker areas." Another challenge that needed to be overcome to complete the final grade on "Rovers" was to correct the tendency for the characters' flesh tones to take on a magenta hue. "For this, I used DaVinci Resolve's secondary color control," tells Brown. "Quite often on 'Rovers' you would have shots where multiple characters were in the same frame, and for these we could again employ the tracker, this time combined with the hue corrector or color wheels to even the flesh look across the picture. Sat vs Lum was also employed throughout, so that the shadow areas were as clean as possible. Finally, subtle vignettes were applied throughout to frame the characters and add some intimacy." "From when I first trained to use a DaVinci 2K system for drama post production, DaVinci Resolve has been invaluable in allowing me to enhance the creative look and vision from the director and cinematographer," Brown concludes. "The amazing tools within the latest version of Resolve massively helped with bringing 'Rovers' to life."